Using a Fuji Frontier Professional Film Scanner, we produce high resolution scans of your memories. We can scan 35mm-120mm film and slides. We scan film and slides at 6 megs or 1200x1800ppi to 40 megs or 3000x4500ppi. Our single frame film scanner can also scan large format film sizes, such as 4x5, 5x7, 8x10 and 620. 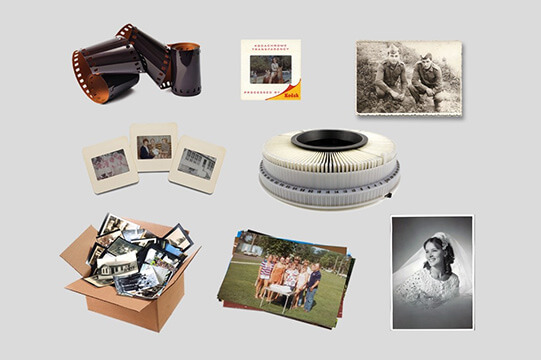 We can produce the highest quality digital files for you to share your memories - anything from old film laying around your house to original printed photos. We use Kodak's Picture Saver scanning system that "digitizes" your family photos, vacation photos and other treasured memories to share with everyone you care about. Our flatbed scanner can give you high quality scans of your old photographs at low risk of damage, as there is no movement required. We are able to scan documents, books and magazines. We also offer oversized scanning. We also use a Bulk scanning system to scan large amounts of photos in a short period of time. We recommend that the photos used for bulk scanning are modern style prints that are undamaged, and not sticky on the back to get the best quality photos. Modern photos that are not sticky, cracked, torn or mounted at the minium size of 3x3 to the maxium size of 8x10. Scans are of the entire image, including borders. If printing copies of scanned pictuers, 4x6s with no cropping are recommened.